These single-serving fruit crisps are super easy to make and one of Kate’s favorites! They make a great snack for anyone in the family–or serve with a scoop of ice cream and impress your guests with their own individual little dessert! 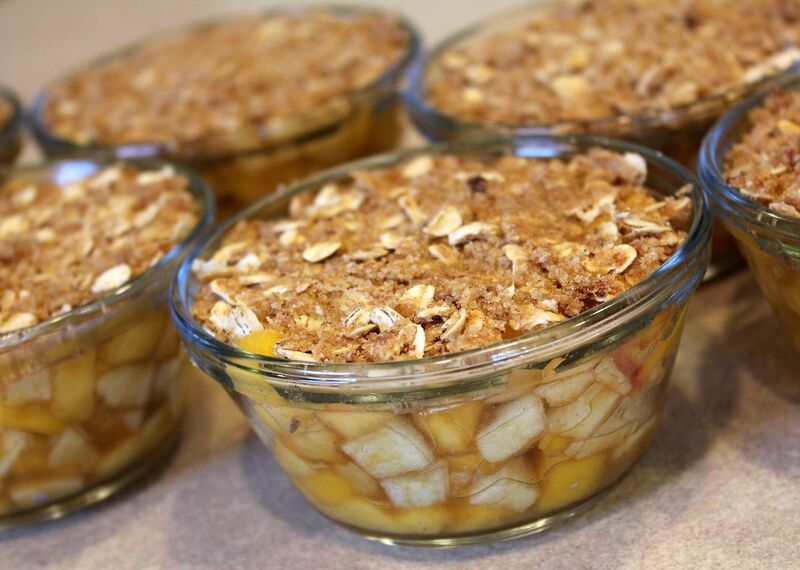 I picked up these glass custard cups at Target (you can also find them here ) and they’re perfect for this recipe. They’re oven and freezer friendly, and come with lids. We have a couple sets of these custard cups and use them daily as glass storage for storing and reheating Kate’s leftovers. They really come in handy! 1. Chop your fruit into bite-sized pieces appropriate for your child’s age/eating ability. I made this batch using apples and peaches, but you can use any kind of fruit you’d like–or try a combination of fruits for a fun twist! 2. 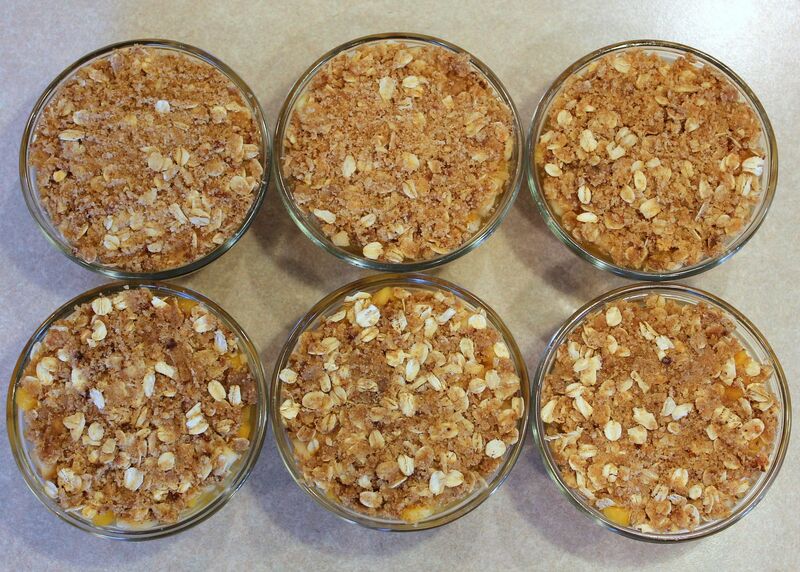 Mix topping ingredients in a small bowl; blend with fork until crumbly, and sprinkle evenly over fruit cups. 3. 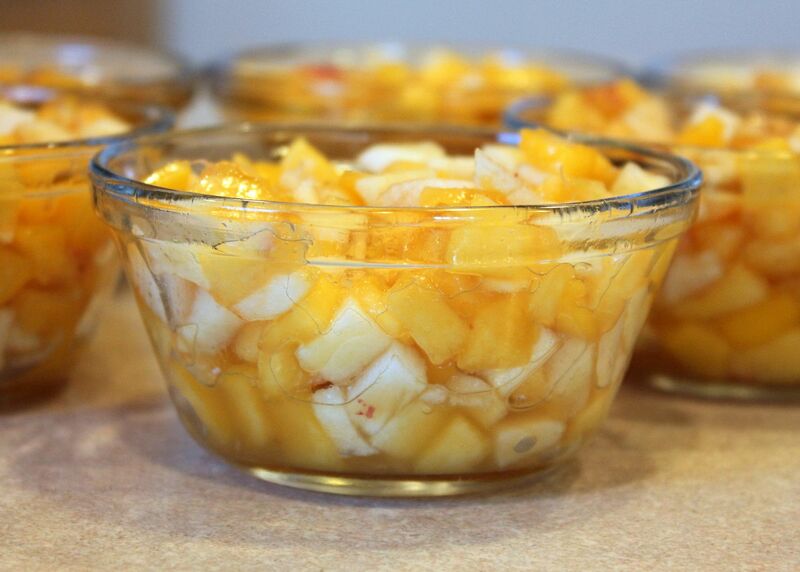 Place custard cups on a cookie sheet and bake at 350 degrees for 25-30 minutes or until fruit is tender and topping is golden brown. Enjoy while warm, or cool completely and seal with lids for freezer storage. Thaw overnight in the fridge before rewarming (in oven or microwave) and serving. Oh yum. Thank you for this!! These look yummy – and healthy!! Your blog is seriously an inspiration, since I am just starting out. Thanks for all the great recipes and fabulous photos! If I was at home with an apple I would be making one of these the moment I left my computer… Thanks for sharing! They look wonderful!